This article will help you to understand how to create user registration and login example using Spring MVC, JdbcTemplate and MySQL database. Spring framework gives us the JdbcTemplate class to query with the database in its Spring JDBC module. It also provides the DriverManagerDataSource to create the database connection between the application and database. If you don’t know how to create a database connection, check out my Spring database connectivity article. In this application, we create will create registration form so that user can register and their details will be stored into the database and a login form so that user can able to login into the application using their user id and password. These are the required dependencies that must be your build path. To get all these dependencies all the following code in your pom.xml. 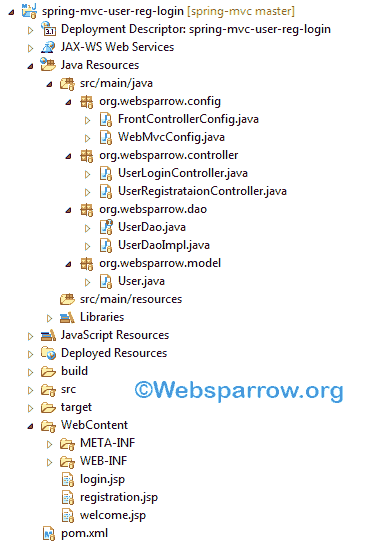 Final project structure of our application in Eclipse IDE will look like as follows. Create a model class of User that contains user information. Create the UserDao interface. It will contain the method signature. Create another UserDaoImpl class that implements the UserDao interface and define the body of UserDao methods. This class will also instantiate the JdbcTemplate class by passing the DataSource object to query with the database. Note: If the loginUser method will not be surrounded by the try-catch block then the queryForObject method of JdbcTemplate class will throw an exception if it is not found any user id into the database. You can use the queryForList method as an alternative to fetch the user id from the database. And the Spring MVC configuration class will be given below. In this class, we will create a database connection, intantiate the UserDao and InternalResourceViewResolver. UserRegistrataionController class is responsible for handling the user registration process. It will collect the user information and store it into the database. UserLoginController class is responsible for handling the user login process. It will fetch the user information from the database and display it on the JSP page. registration.jsp – It contains the registration form. login.jsp – It contains the login form so that user can login. welcome.jsp – This page will display is username if and only if the user can successfully logged in. If the user successfully logged in, you will be redirected to the welcome page and will display the following message. Welcome atulrai, You have successfully logged in.